WASHINGTON, Sept. 4 (Yonhap) -- The new U.S. envoy for nuclear talks with North Korea ruled out the possibility of lowering the bar for reopening negotiations with the communist nation, insisting Thursday that it is not too much to demand the regime first demonstrate its denuclearization commitment. Sydney Seiler, who has taken office this week as special envoy for the six-party talks, also said the U.S. is trying to win the release of three American citizens detained in North Korea through the "New York channel," which refers to the North's mission to the United Nations. Seiler, a top Korea expert who served as director for Korea at the White House National Security Council, urged Pyongyang to "act in a humane" way and release the three, saying the cases have posed "significant obstacles" to improving relations bewteen the two countries. "We are not ideologically opposed to dialogue with North Korea, nor have we placed insurmountable obstacles to negotiations in our insisting that North Korea simply demonstrate it will live up to international obligations and abide by international norms and behavior," he said in a speech at the Center for Strategic and International Studies. "The bar has not been set too high by insisting that denuclearization talks be about denuclearization," he said. The six-party talks, which bring together the two Koreas, China, Japan, Russia and the U.S., have been stalled since the last session in late 2008. North Korea has long called for unconditional resumption of negotiations on nuclear and other bilateral issues, but the U.S. and South Korea have demanded that the communist nation first take concrete steps to demonstrate its commitment to denuclearization if negotiations are to resume. The demand reflects the deep skepticism Washington and Seoul have about North Korea, a country that has a track record of starting a crisis, coming to negotiations and reaching an agreement in exchange for economic and other concessions, before reneging on its promises. 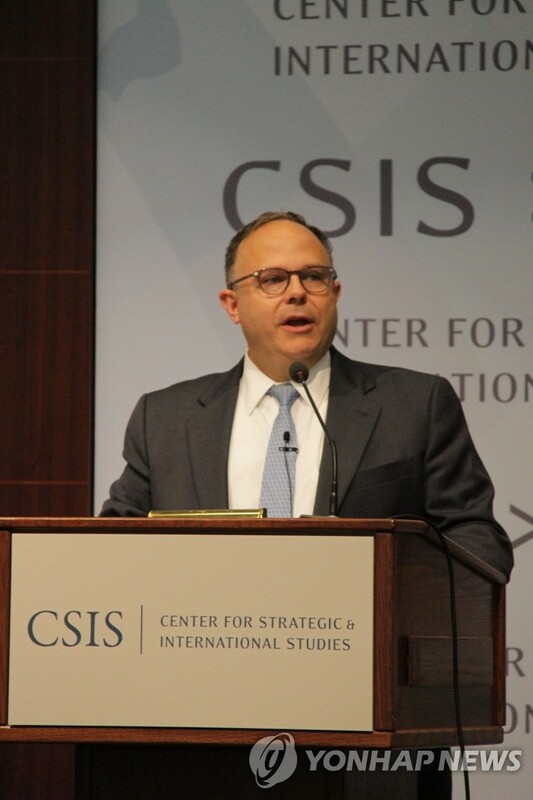 Seiler said the U.S. policy on North Korea is composed of three key elements -- diplomacy, pressure and deterrence, and that Washington will continue to seek robust implementation of U.N. Security Council sanctions resolutions and its own sanctions on Pyongyang. But he also held out the prospect of easing sanctions. "If DPRK makes the right choice, returns to the negotiating table and embarks on a credible path of irreversible denuclearization and begins to comply with its international obligations and commitments, the appropriateness of sanctions will of course be reviewed," he said. Seiler said that the U.S. will also continue to use the framework of the six-party talks as the forum provides a useful platform for diplomacy. The U.S. has been and will continue to be willing to engage North Korea to probe its intentions and help the regime make the right decision by presenting to the leadership an alternative path as well as to "prove our sincere commitment to improve U.S.-DPRK relations" once the North begins down the path of denuclearization, he said. "But clearly, the ball is in Pyongyang's court," he said. Kurt Campbell, a former assistant secretary of state, said that many U.S. government officials handling North Korea are suffering from "fatigue and a sense of exhaustion" in terms of strategies, after various tools, including pressure, have failed to make progress. "We are in a set of circumstances now where it's not clear fundamentally the way froward," he said. Still, the U.S. has been successful in keeping other members of the six-party talks, including China, together, Campbell said. "I think China over time has come to understand that North Korea is in fact acting in ways that are quite antithetical to its strategic interests," he said. "I think what we've seen in the last several years is a deep frustration and worry that in many respects, what North Korea is doing is creating a security dynamic in North Korea that is profoundly not in China's strategic interests." This attitude is a profound change from the past, he said.